Kim Kardashian Divorce: Kanye West Pushing Wife to Quit KUWTK, Kim Wants to Quit Marriage! Kim Kardashian wants to quit her marriage and divorce Kanye West, not quit KUWTK ! While media outlets are sharing photos taken from Kris Jenner’s annual Christmas Eve party touting the wonderful time had by all, anyone find it strange that NO ONE is smiling in any of the pics? Pics of each Kardashian and Jenner daughter demonstrate one thing…the overall feeling of the special night was pure torture. Kim Kardashian and Kanye West showed up with daughter North West and posed for photos of their own, ending in documented memories of North’s unpleasant encounter with Santa, Kim’s cleavage-baring outfit, and Kanye’s even more cleavage-baring jacket. None of the pictures captured any of the family smiling except for one in which Kim captioned “three-generations” of her and daughter North alongside Kim’s mom Kris. Kris was the only one smiling, and that was likely only because she was completely drunk and gleeful over the fact that the night didn’t have to end with Bruce in her bed as in years past. Reports have been swirling that Kourtney Kardashian is at the point where she is ready to call it quits on Keeping Up with the Kardashians, and Kanye West wants Kim Kardashian to follow suit. Pushing Kim too hard will make her quit the marriage, not the show! Divorce will be what Kanye reaps for his efforts. Everyone is getting tired of their contractual obligation to play nice and spend time together. Kanye didn’t even want to go to the party at all, but Kim pressed the issue because she needed to show for the cameras and she was not about to show up alone to another major holiday alone. She was determined to have pics of the three of them together. 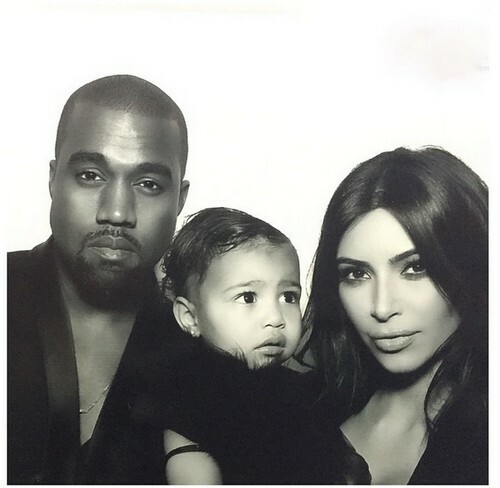 Shortly after she, Kanye and North took some photos, they were ready to get out of there. Kris and Kylie were drinking and seemed depressed, despite dad Bruce Jenner briefly showing up. Even in the picture with their father, the girls didn’t crack the slightest smile. Tyga, French Montana, Scott Disick, and Rob Kardashian were reportedly all absent. No one wanted to go, but Kris’ daughters had to make the appearance. They all fulfilled that obligation, but were notably miserable doing so, and all went on their separate ways as soon as they were allowed. Kanye is seriously pushing Kim to quit the show altogether, telling her that as a couple, she’ll remain in the spotlight and have all the money she needs. Kanye knows that Kim wants to leave (and divorce) and he is trying to put her in a position to be more dependent on him. Leaving the show would serve many purposes for Kanye—Kim wouldn’t be under Kris’ thumb, Kim would be more dependent on him, Kim would be available to live in Paris with him for months at a time. Kim is over the show as well, but is searching for other projects now. The last thing she wants is to be reliant on Kanye for anything. Kim Kardashian is over Kanye West and nothing is going to change that – Kim wants a divorce. Kanye pushing the issue is only making things worse. The whole Kardashian-Jenner family is miserable right now, and by looking at the pictures from their holiday party…it shows!